Citrus Tree Gardens is located at a distance of 10 minutes from the town of Kyrenia. 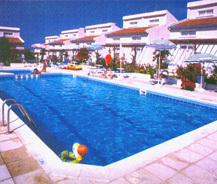 It is at a walk able distance from the beaches of North Cyprus and the shopping arena. It's surrounded by a great variety of flora. You will be provided with numerous alternatives for accommodation including mini villas, rooms with balcony, special suites and a dulcet restaurant and a lobby bar as per your budget. Citrus Tree Gardens has lot of offerings for its guests. Facilities provided here will feed your comfort requirements to a considerable level. You can relax sitting on the easy chair and relish the view from the balcony of your hotel room. The panorama of the place will make your stay exceptional and memorable. Guests will experience the authentic and wide variety of food offered by the hotel. Apart from this, many amusement activities are held for the entertainment of guests. The hotel has been a family business. They have been carrying their special treatment to the next generation. The cordial reception of the hotel management will just leave you speechless. Citrus Tree Gardens will welcome you with its arms wide open to provide you an exquisite and mind blowing experience which would be cherished for a life time.